An entirely self-sufficient, off-the-grid building designed to educate students and the public about low-carbon issues has turned to crowdfunding to upgrade its own energy and water systems. The Earthship Brighton: Plugged Into Nature Campaign aims to raise £20,000 within the next month for the installation of battery banks, vegetable oil-powered generators and an ultraviolet water filtration system for a low-carbon building. The campaign describes Earthships as “buildings with no links to mains, are made using recycled materials such as used car tyres and glass bottles, and use the sun and rain to provide all their energy needs. "The key feature of any Earthship is that they are self-sufficient. Not relying on mains water or energy from big companies, Earthships are self-contained living vessels that combine beauty and comfort with low carbon living," it says. Since its construction in 2006 by the Low Carbon Trust, the Earthship Brighton building has been awarded with over 11 sustainability awards. But the building, situated near the city's Stanmer Park, is in need of renovation which is why the campaign is appealing to the public. The £20,000 target will be spent on a £3000 ultraviolet water filtration system to purify rainwater. Almost half of the funding will be used on two new battery banks to store renewable energy from the buildings solar panels, including an extra £5000 for a straw bales battery house. And another £3000 will be spent on a back-up generator powered by vegetable oil. The building is currently viewed as a model, low-carbon education hub. By installing these extras, the building would be able to host more open days to educate visitors on the costs of living in a self-sufficient building, promoting a low carbon lifestyle in the process. 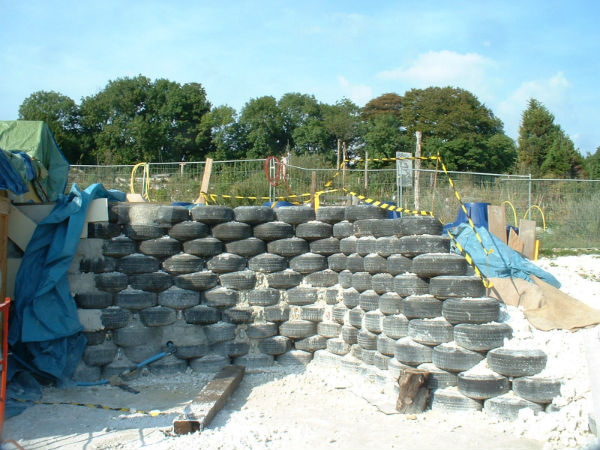 Earhtship Brighton is one of two 'Earthship' hubs, with another Earthship visitor centre situated in Fife, Scotland, which is run by the Sustainable Communities Initiatives (SCI). In April 2007, planning permission for a residential development of 16 Earthships homes in Brighton was granted. The project has stalled due to problems with the land purchase but the push for self-sufficient homes is still strong. Currently half of the UK's carbon emissions come from the built environment. Homes are responsible for 27% of the UK’s CO2 emissions with 60% of energy at home used for heating. Even construction of homes is considered carbon intensive, with around 7% of global CO2 emissions caused by the production of cement. More and more low-carbon innovation companies are turning to crowdfunding, which gets smaller companies off of the ground and turns innovative designs into reality. Earlier this year, the world's first ever smog-absorbing tower in the Netherlands after its Kickstarter page raised almost €30,000 more than the €50,000 target. And earlier this week, America's largest solar desalination project also turned to crowdfunding in an attempt to raise $10m to part fund the project set for construction in California.